After studying at Manchester University in the early 80's Patrick worked for a time as a forester in Scotland. He went on to work for the National Trust in Cumbria before setting up as a full-time artist in 1987. Working in acrylics, Patrick moves comfortably across a variety of subjects portraying them in his own distinctive style. At the begining of his artistic career he painted mainly natural history subjects and was a member of the Society of Wildlife Artists. Nowadays he concentrates on landscape and in particular, strong light effects therein. He has held two exhibitions in the Portico Gallery in Manchester and has shown his work in a number of North West city galleries. 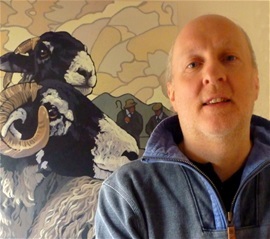 His work has also been exhibited in various Cumbrian galleries including the Lake Artists Society Exhibition in Grasmere. In addition Patrick holds regular one man shows in the Moot Hall, Keswick. All paintings are original acrylics on block canvas. Postage and Packing costs £10 - £25. They are unframed but can be hung as they are.